Chairman of the 5th WJEC Organizing Committee Paris 2019. Pascal GUENEE is the organizer of the fifth edition of the World Journalism Education Congress. 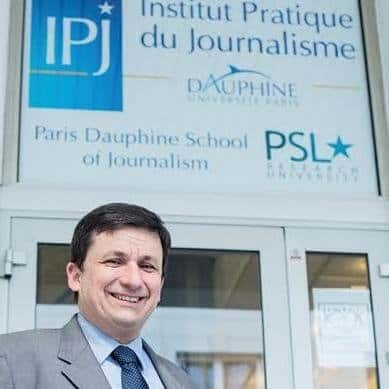 He is the head of Institut Pratique du Journalisme, Paris-Dauphine University Journalism School since 2001. He is the General Secretary of the French Association of Journalism Schools, and the former President of the international network of French speaking Journalism Schools. He is the treasurer of the French National Conference on Journalism Profession. He is also a key expert on Journalism Education for the European Union twinning program. He has also been the coordinator of the French version of UNESCO’s Model Curricula for journalism education. Previous to his academic career in journalism and in political science, he was a journalist and a publisher. He started his career in 1986 for the French tv network La Cinq, he then founded Movietel, a news agency specializing in the film industry in 1989. Following this, he became the Editor in Chief of three reviews: Cinema magazine, Digital Creation magazine and Pixel magazine. His research work is aimed towards journalism accreditation programs & standards and he is currently working on a project on journalism safety and trauma.